Jaci’s Lodges are situated in the Malaria-free Madikwe Game reserve, boasting 75 000 hectares of Big 10 territory. You can expect to see Wild Dog, both Black and White Rhino, Lion, Leopard, spotted and Brown Hyena, Cheetah, Giraffe, Buffalo, Elephant and extensive plains game such as Eland, Gemsbok, Red Hartebeest, Springbok and over 350 species of game. Game Drives are offered in the morning and afternoons / evenings ( including a night drive ) and are conducted by experienced field guides or rangers. For the more adventurous, Game Walks into the bush are also offered. Children of all ages are welcome at Jaci’s Lodges. Children 4 years and younger go on their own Jungle Drives during the day and eat dinner at 18h00. Children ages 5 – 12 years old are allowed on the adult game drives and eat dinner with their parents. Child minders are offered for younger children. Jaci’s Safari Lodge masterfully blends into its surroundings, encompassing a magnificent main area built around an ancient termite mound. The location was discovered and the concept envisaged by Jan in combination with Jaci’s colorful decorating style and attention to detail you are sure of a memorable and unique Safari experience. With only seven rooms, the Safari Cottage and the exclusive 2 bed-roomed Nare Suite. All the rooms and the Nare Suite are built using shaggy thatched roofs and canvas walls to create a “tented” feel. Each room has and open plan bathroom with a hand built “rock” bath and outdoor “safari” shower. A private wooden viewing deck at the entrance overlooks a small stream where animals and birds come to drink. Enjoy fire cooked meals in our enclosed boma, or under the stars at a bush braai. Lounge at the pool or enjoy bird watching from the hammock on the bank of the Groot Marico River. Indulge yourself in your surroundings. Featuring only 8 rooms and 2 exclusive family suites – the Nare Suite and the Safari Suite – utilizing astunning combination of stone, canvas and shaggy thatch roves creating a true safari atmosphere, inviting you to enjoy your bush surroundings. Early risers may catch a glimpse of Bush Babies returning to roost in the trees around the rooms or enjoy the morning Francolin add a space here pleasecalls. The generous Main Lodge consists of a spacious lounge and open plan dining area with uninterrupted views of the surrounding bushveld. Nare Suite is an exclusive “bush retreat”- so named because of the resident Buffalo Bull who frequents the waterhole in front of the Suite (along with the numerous other animal visitors) – accommodating a maximum of 4 to a maximum of 6 guests in bush luxury and privacy. The Nare Suite bedrooms each have open plan bathrooms, with a hand made “rock” bath and outdoor “safari” shower. An upstairs loft room is ideal for children and features it’s own toilet. A wooden viewing deck overlooks a fabulous water hole and encompasses a private swimming pool. The lounge and outdoor dining area, is equipped with a self contained kitchen – where our chefs can prepare meals for you in the luxury of your own retreat – should you so desire. Equipped with a private game vehicle and professional guide you are assured of a bush breakaway to be remembered and repeated. Renovations are finished and the Safari Suite is looking fabulous – with 2 double bedrooms and 2 children’s rooms this is the ideal family suite. beautifully positioned overlooking the Marico River with a private pool and wrap around decks, the newest addition to Jaci’s Safari Lodge is a must for families wanting to stay close in close proximity to each other but not necessarily in the same room. overlooking your private plunge pool and the Marico River. With Jaci’s trademark shaggy thatch roof’s, and sliding doors and canvas all opening to the magnificent views you can enjoy the privacy afforded by the Safari Suite whilst enjoying the priviledge of planning your own itinerary. Accommodating 5 to a maximum of 8 guests – combined with the flexibility of your own game drive vehicle and private guide – the Safari Suite is an ideal option for a family travelling together on a family safari. Reflecting the design and interiors of Jaci’s, Jan and Jaci have converted the Safari Suite into a comfortable and authentic family unit. Jaci’s Tree Lodge opened in December 2002 – with Eight “Tree Houses”, each encompassing a giant Tambotie or Leadwood Tree. Each “Tree House” is constructed amongst the Riverine forest on stilts, up to 6 meters above the ground. In these spacious “Tree Houses” – built utilizing a combination of rosewood, thatch and stacking doors – the forest surrounds are invited in, to compliment your stay with us. An open plan, en-suite bathroom with an enormous stone bath and outdoor “Jungle Shower” allow you to enjoy your forest surrounds. The raised rosewood walkways link the rooms to the main lodge – inviting you to explore your luxurious tree house. Luxurious silk cushions, cotton bed linen complimented by burnt orange suede beanbags, invite you to lie on the deck to admire the stars. The open plan bathroom features an enormous stone bath and handmade copper taps as well as an outdoor “jungle” shower. The spacious open-plan main building at Jaci’s Tree Lodge includes a magnificent bar and lounge area separate from the dining area by a 4 sided open fireplace. Madikwe Game Reserve, being a malaria-free safari destination is a natural choice for parents wanting to introduce their children to the African Bush. Nothing beats seeing the wonder in your child’s eyes when they see a lion for the first time, or how they enjoy learing about why a Kudu has such large ears. 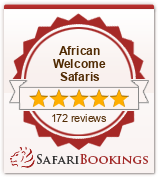 The game guides of Madikwe like to focus on the “Top Ten” rather than the Big Five. So, in addition to the well-known lion, buffalo, leopard, elephant and rhino, families have great chances of seeing hippo, giraffe, endangered wild dog, both brown and spotted hyena as well as cheetah. Children under 5yrs can be specially accommodated with their own “jungle drive”on request. The “jungle drive” is educational, informative and deliberately shorter, to keep younger children engaged.